The hype surrounding the unprecedented sanctions levelled against Moscow for its alleged involvement in the chemical weapons attack in Salisbury has once again highlighted the importance of diversifying Russia’s external economic and commercial ties. The Russian Federation’s trade dynamics in the Middle Eastern region are, therefore, noteworthy in these conditions. In 2017, its foreign trade turnover increased three times on account of its food sector. For example, almost half of the wheat purchased by Egypt, a highly populous Arabic country, comes from Russia. In 2017, the nation imported $1.4 billion worth of Russian wheat. The same year, Russia’s foreign trade volumes to other countries such as Syria, Sudan, Kuwait and Tunisia rose two-fold, and trade with Saudi Arabia increased three times. The quantity of Russian food products sold to the United Arab Emirates soared by 150 percent, 80 % of these supplies are accounted for by grain. Local media outlets have been reporting on these numbers under headlines such as “Wheat is Russia’s weapon in the Middle East and Africa”, “Russia’s growing influence on Middle Eastern wheat markets”, etc. This contrasts with the situation of not too long ago. In 1970s and 1980s, when cooperation levels between the Soviet Union and Arabic nations were at their peak, Moscow could not meet its partners’ demands for grain. Russia itself bought increasing volumes of grain from Australia and Canada, which depleted its foreign reserves. But the dependence of Arabic nations on food purchases, first and foremost on those of grain, from Western countries limited their freedom to act. For instance, at that time, three out of four pieces of flatbread in Egypt were baked using the flour supplied by the US at subsidized rates. This was used as a means of influencing Cairo’s policies in Cold War times. At that time, the term “food security” entered the political lingo in the region. Fearing blackmail in this regard, Arabs proposed an initiative to turn Sudan, with its vast uncultivated lands and abundant precipitation, into a “food basket” for the region, with participation of the Persian Gulf nations. But this plan never came to fruition for various reasons. In the last decades, Saudi Arabia produced enough wheat to meet its own demands, but from 2008 onwards, it stopped doing so because of acute deficits in water supply and started increasing its imports. Hence the food market of the Arabic world, with its population of 400 million, is vast. The Future for Advanced Research and Studies centre in Abu Dhabi (UAE) has noted that it is more advantageous for Arabic countries to purchase wheat from the Russian Federation and not the USA, since transporting the grain to the Middle East from the former is 1.5 times cheaper than from the latter. From the centre’s point of view, Moscow’s political and military presence in the region has spread due to its involvement in Syria, thus lending importance to economic and trade deals with Russia. In recent times, there has been talk about the prospect of tying food supplies from Russia to those of citrus fruit and vegetables from the Middle East in exchange. Initiatives to build facilities in Arabic importing nations for storage of Russian grain have been discussed. According to the Syrian Transport Minister, Ali Hammoud, this can be done in one of the country’s ports with the aim of supplying the Syrian Arab Republic and other countries in the region with food. Saudi Arabian authorities are laying the groundwork for their investments in joint agricultural enterprises with Russia in its territories. These companies will grow wheat and other grain crops, which will be subsequently transported to the Kingdom. Moscow’s ability to ensure stable supplies of grain and other products has improved its image, as a partner with a reliable reputation and a broad range of goods for trade, thus dispelling the myth about Russia’s global isolation. 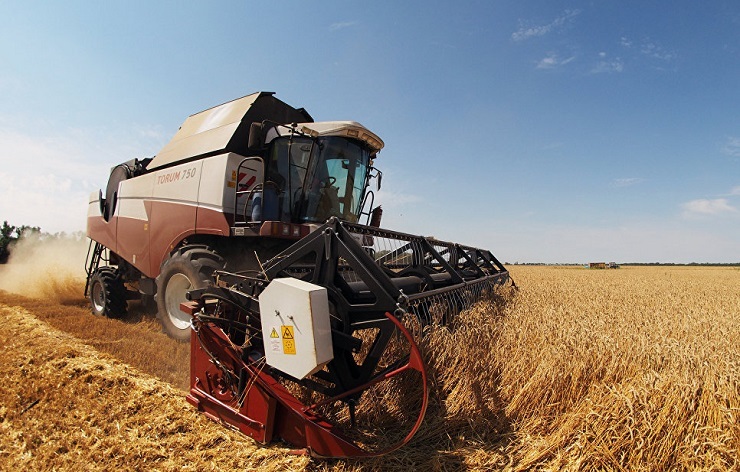 New opportunities, starting to appear, are aimed at promoting the export of Russian grain and a wide range of food items to the Middle Eastern region, thus ensuring its sustainability. On a global level, this can provide both suppliers and customers with insurance against market fluctuations and collapses, including imposition of sanctions practiced by the West, and especially Washington.